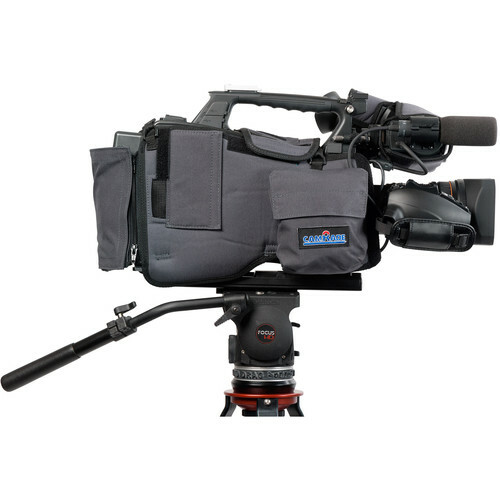 The camRade camSuit for Sony PDW-850 Camcorder is a formfitting protective cover handmade from Cordura nylon with interior foam padding to protect against scratches and damage. A rain cover is included in a detachable pouch, and clear vinyl windows provide direct access to the display and controls of the camera. The cover provides full access to all ports, memory cards, and batteries via an opening secured with a hook-and-loop fastener. A separate protective cover is included for the camera viewfinder. A pouch for a wireless receiver is also supplied and attaches to the rear of the camSuit with hook and loop fasteners. The camSuit comes in a zippered, waterproof pouch that you can use for transport as well as storage. Box Dimensions (LxWxH) 16.5 x 14.0 x 3.25"